Place all the ingredients in the food processor and blend until well combined. The texture should be smooth and have a fudge like consistency. Using a tablespoon, scoop out mixture and roll into balls. Place them in the fridge for 30 minutes before serving. 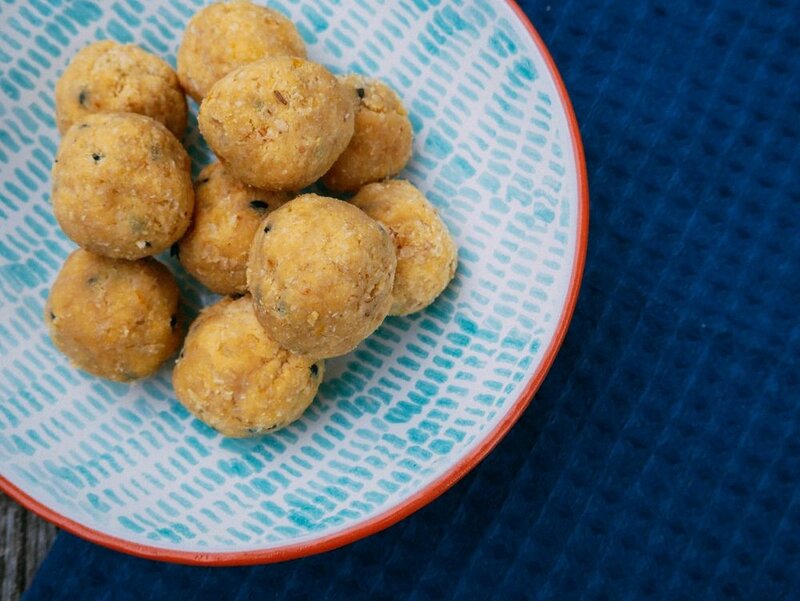 These passionfruit bliss balls are sweet, tangy and fudge-like, making them perfect for a mid afternoon pick me up to curb those sugar cravings. Keep them in your fridge to have as a treat with a cup of tea or to pack as a snack. They are refined sugar and dairy free and made from nourishing ingredients. The purple skin and orange flesh, indicate that they are rich in antioxidants. Passionfruit contains vitamin C which helps to improve immunity, they also contain vitamin A which helps with the growth of healthy cells and fights infection. For more delicious recipes containing passionfruit, check out the 5 + A Day website.